Saying goodbye in Jerevan was not easy after such a nice stay. We were helped by Greta, the hostess and two French guests to get all our stuff down the alley and the stairs to the street below. Greta's B&B is situated in a quarter on a steep slope adjoining the centre of the city. Her house can only be reached (and consequently left) by a one meter wide alley and long concrete stairs. Not an ideal place to stay for bicycle travellers one would say, but the hospitality and atmosphere compensates largely. The way to our next B&B was not hard, as it was largely through the plain south of the city. Urts'adzor is a small village where our lodgings where to be found in a simple house on a dirt road. Our hostess Heriknaz is a lady who lives in this house with her youngest daughter Liana, 22. She has a cow, a garden where she's always workong in, she has chicken, like most (all) of the villagers, she is very self-supporting. Most men have jobs in Russia and elsewhere, she is a widow and has to manage on her own. She is learning English and doing her utmost to make it easy on her guests. We were presented with sweets, pastries, coffee, a good meal etc. And in the mean time she tried to practise her English. The girl next door joined in the evening and we had interesting discussions. Travelling this way makes you learn a lot! The next day was hard, we had to climb one thousand meters in 20 kms. Need not explain that that's not that easy on a bike, carring app. 20 kgs of luggage. It really was our toughest day untill now during this trip. 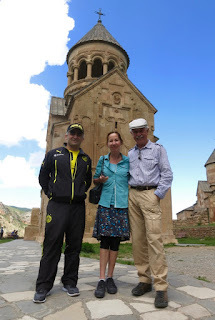 We ended up in Ashot&Gohar's B&B in Chiva. A very simple, but again very kind, place on a dirt road, but: on Booking.com! We decided to make it a two-day stay for two reasons. One: sore legs. The second: we agreed with the son of the house, Hrayr, to make an excursion to Noravank. 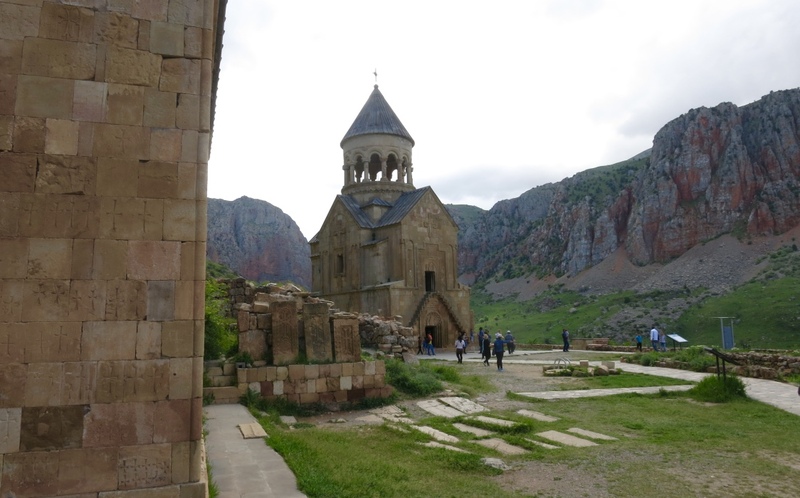 It's another world heritage monestary site, not far from here. So today we had a lovely relaxing day that not only included the visit to the monestary, but also a visit to the oldest winery of the world! No joke, there is a cave in which archeologists have found the remains of a winery of app. 6000 years ago. As proof the oldest shoe of the world, 5500 years old, has been recovered from this site. It's in a Jerevan museum. The region is still famous for its wine: Areni. In the one local winery we bought some bottles, one for the hosts, one for Hrayr and one for ourselves. Sometimes you must make life agreeable for yourself and for your companions, shouldn't you? After a 1000m climb a few bottles of wine sounds like a perfect way to make life that little bit more agreeable for you and your companions. 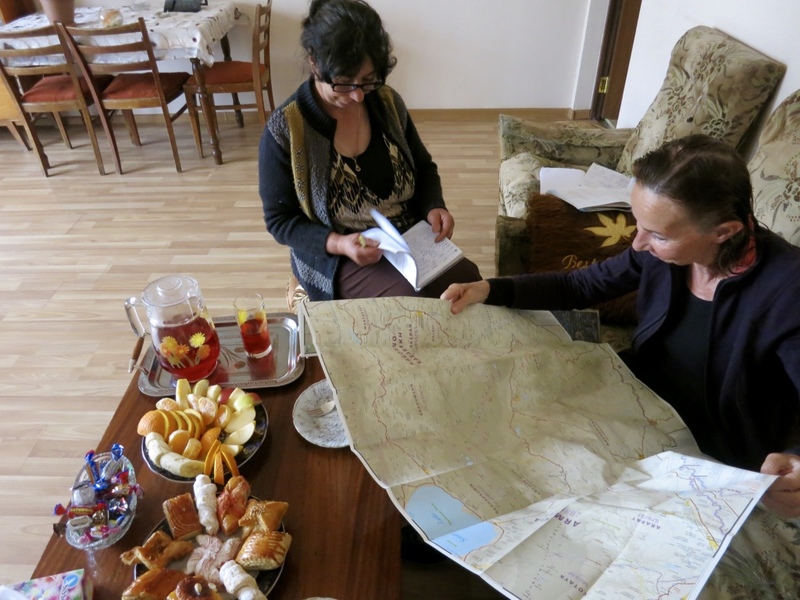 It's extrordinary how the internet and intrepid bloggers like you can bring remote parts of the world into our home - Google maps even shows Ashot & Gohar's B&B. Keep those good legs pedalling and that corkscrew handy! only saw your reaction on this post now. Should be more attentive! How are you doing? Coming to Europe again some time?